B & H Engineering, P.C. has provided construction inspection services, as a prime consultant, to the New York State Department of Transportation for preventative maintenance work on seven viaducts. The project included 96th Street viaduct, 42nd Street ramp, and South Street viaduct on the Franklin D. Roosevelt Drive in Manhattan; and Coney Island viaduct, Owls Head viaduct, Hamilton Avenue ramp, and Battery Tunnel viaduct on the Belt Parkway/Brooklyn-Queens Expressway in Brooklyn. The Construction inspection services consisted of providing field inspections, monitoring work zone traffic control, coordination with NYC agencies, other contractors, and utilities; reviewing contractor's schedule, equipment, and staffing; monitoring contractor's EEO requirements; processing payments and change orders; and maintaining office records. 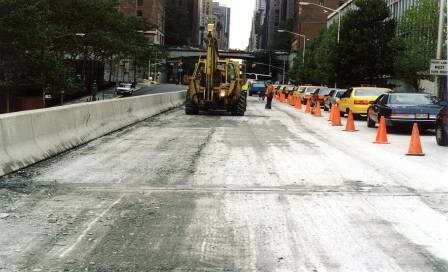 The contract included following work: repairs to concrete pavement on several viaducts; replacement of epoxy overlay with new micro-silica; sealing roadway cracks, and replacing expansion joint sealants; thermoplastic pavement markings; cleaning drainage scuppers and troughs; installation of bumper guards at street level of columns; replacement of bearings; structural steel repairs; and painting of steel columns.